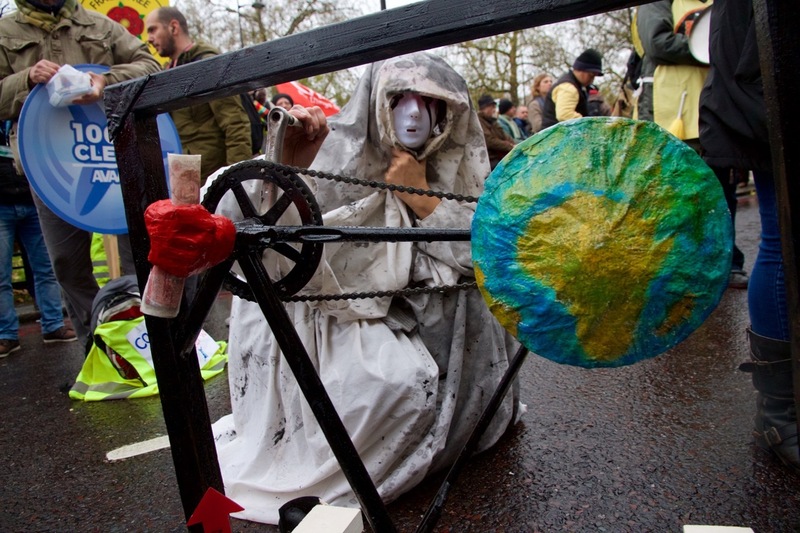 In the largest of the international protests held this weekend, tens of thousands of people braved wind and rain to march the streets of London in a demonstration calling for political action against climate change. On Monday, world leaders will gather in Paris for a United Nations climate summit known as COP21. Nearly 150 countries will attempt to create a new long-term deal to limit climate emissions. France remains in a state of emergency following the November 13 terror attacks in the capital, and large gatherings have been banned — forcing protest organizers to shelve demonstrations they had been carefully planning for months. This hasn't stopped an international outflow of support and action. An estimated 2,500 protests were held around the world this weekend — including events in Australia, Asia, Africa, and the Middle East. Organizers estimated that 50,000 people took part in London's march on Sunday, which followed a route from Hyde Park past Downing Street and Parliament Square to Millbank on the Thames. Some demonstrators came in costume, with giraffes, polar bears, Grim Reapers, and penguins in attendance. Others carried signs with messages like "No fracking for my grandkids," "the Earth will survive climate change — we won't," and "renewable is right on." Three coaches of participants reportedly came 40 miles from the seaside town of Brighton on buses that were powered by fryer oil. Celebrities who attended the march included Radiohead's Thom Yorke, who played records on the Greenpeace float, Charlotte Church, who sang, and actress Emma Thompson, who said she hasn't taken a plastic bag from a supermarket in 10 years. Volunteers along the route handed out free apples "picked from a farm this morning." Music along the way was provided by the Strawberry Thieves Socialist Choir, among others. "The environmental crisis is the biggest threat facing the vast majority of people on Earth, and a handful of big businesses and companies are responsible for creating it," Ian Pattison, 26, a Socialist Party member from Leytonstone in London's east, told VICE News. Related: We Asked Canadian Experts on Climate Change: Are We Screwed? "We absolutely reject the tactics of terrorism used by ISIS," he said, referring to the Islamic State before adding, "[French President Francois] Hollande used the terrorist attack to decrease democratic rights. People want to come out on the streets in France." Paris was mentioned by several speakers, who addressed the crowd from the top of a fire truck before the march began to move. "We march in solidarity with the French climate movement," one woman said. "We will be their voices." The crowd was enthusiastic. Eva Risveno, 18, who comes from the Canary Islands but is studying in the UK, said, "I think [climate change is] the biggest problem we're facing right now. It's really complicated to solve but as a first world country we should be an example to others in terms of policies and using renewable energy." On the Canary Islands, she added, "We take it really seriously because it's an island and its really susceptible to changes in the environment. I don't think [people in London] are in the same contact with nature. Here everything is concrete. There we notice everything that changes." Opposition Labour leader Jeremy Corbyn received a huge cheer before his speech, after which he waved at a man dressed as a polar bear from the top of the fire truck. Addressing the protesters, Corbyn said, "The issues facing the world in Paris this week are pollution, climate change, inequality, environmental refugees, war refugees and resources wars. "If we are to make a real difference in Paris, all these issues have got to be thought about and addressed." Corbyn said that the world leaders must find a way to "use the science, use the technology, use the human genius that we have." He added, "The issue of the environment is a state of mind." "It's really important to show how many people think this is so vital," Jane Tilston, a retired 60-year-old Londoner told VICE News, while praising the turnout. "It's all just talking, talking, talking, the government need to take charge with renewable energy." Tilston said she makes a point of recycling as well as "watching her usage of fossil fuels." For one faction of the march, Sunday was an opportunity to highlight the countries already being affected by the impacts of climate change. A group called Wretched of the Earth sat down in protest around halfway through, causing the demonstration to temporarily come to a standstill. Joshua Virasami, 25, is a member of direct action group Black Dissidents who had joined with others to protest against colonialism, under the moniker "Wretched of the Earth." Virasami told VICE News that for him this was a protest against "European imperialism," adding it is important to remember that some countries are suffering the impact of climate change a lot more than others. Karen, 43, attended the march with her 5-year-old daughter Tenzin, and their dog. She came "for so many reasons: anti-fracking, wiping out rainforests." Karen said renewable energy was one very important solution she could think of. "Anybody here would be happy to spend a little bit more if they knew where their energy was coming from," she said. "Whether climate change is naturally occurring or man-made, there's so much more we can do," she added. Earlier on Sunday in Paris, thousands of people left shoes in the Place de la Republique as markers of their desire to protest. One pair belonged to United Nations Secretary General Ban Ki-moon, while another pair were donated by Pope Francis. A website called March4Me also matched protesters worldwide with a counterpart in Paris, and more than 28,000 people signed up.